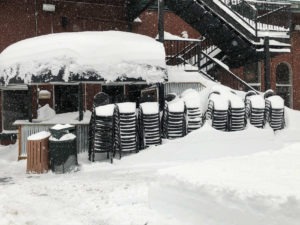 The snow has subsided – for now – leaving behind some incredible snow totals at Tahoe ski resorts. A snowboarder enjoys the 7 feet of snow that Squaw Valley ski resort received over the previous five days. Leading the way was Homewood Mountain, which had the most snow among the Tahoe ski resorts, getting 100 inches (8¼ feet) from the recent storms. The family-friendly ski resort on Tahoe’s West Shore now has 297 inches of snow this season. Homewood was the only Tahoe ski resort to reach triple digits. However, several other Tahoe ski resorts weren’t far behind. Six of Lake Tahoe’s 14 ski resorts got 80 or more inches from the five-day storm, which began Friday (Feb. 1) and concluded Tuesday. Skiing Lake Tahoe will be epic the next few days prior to another storm system arriving Friday (Feb. 8). See the Tahoe Snow Report below. Due to the severe weather that featured high winds, hazardous driving conditions and avalanche issues, many resorts were shut down completely or only running a few lifts during the five days of storms. But the wait was worth it. Skiers and snowboarders were out in force at Tahoe ski resorts Wednesday (Feb. 6), enjoying a glorious powder day. Squaw Valley Alpine Meadows was among the primary benefactors of the storm, recording 7 feet of new snow. It leads the region in snow totals for the season with 341 inches. Located off Interstate 80 at the Norden exit, Sugar Bowl got 80 inches of snow, increasing its season-total to 315 inches. Tahoe skiing was off the charts Wednesday. Skiers and riders at the Vail Resorts in Tahoe – Northstar California, Kirkwood Mountain, Heavenly Mountain – also enjoyed a fabulous Wednesday in the powder. Sierra-at-Tahoe reported 2 feet of new snow Monday morning and a storm total was a whopping 90 inches. Sierra-at-Tahoe received 90 inches and now has a season-total of 279 inches. Boreal Mountain had a whopping 86 inches from the recent storms, pushing its season total to 307 inches. More Snow on the Way: There are two weather systems moving into the region, according to OpenSnow California Snow Forecaster, Bryan Allegretto. He’s calling for 8-12 inches from the first storm that runs Friday (Feb. 8) through Saturday. A second storm could bring another 1-3 feet by Sunday evening.